I needed a Zen moment. Eating supper in the company of fifty other loggers in the noisy cook shack at Juskatla, the brassy din echoing off the stainless steel and Formica fixtures breached my toleration limits. I planned my escape for right after I cleaned off the mountain of food on my plate. I could stay in my trailer at Tlell and return early the next morning for work. Just wanting out, I passed on taking a shower so I was still in my logging gear. I’d toss my caulk boots in my car before leaving camp. Soon, I was speeding my rust-bucket into ‘town’. I joined the after-supper exodus in my ’75 Parisienne, careening around blind, slippery hairpin corners, barely keeping up with the other guys on the road. Most were heading to the bar in town, and that bar was only fifteen miles of Queen Charlotte Island mainline corduroy away. Choking back dust, fishtailing around teeth-rattling potholes, surviving windshield-eating gravel spraying all around the car, I successfully dodged aloof black bears and the maniacal drivers heading into camp for night shift - also driving at break-neck speeds. The goal was cold draft beer poured into frosted mugs in the Port Clements pub. However, tonight, I was keen for Coho fishing. Getting a hook in the water and enjoying the peace and solace on the riverbank meant I could ward off the logger blues creeping in on me again. The lead cars of the convoy turned left into the pub parking lot. After dropping off two riders, I scored a quick six-pack at the store, and then lit off for Tlell. Bouncing along the heaving, dangerously rutted highway punched through twelve miles of scrubby Spruce swamp, the sun was bright, the colors vibrant and the beer cold. Slowing down, crossing the timbers of the Tlell river bridge, I saw the dark water flowing upriver, inland. Perfect. The Coho will be pushing in with the tide. Tourists fish downriver; I want no part of that. I’ll head to my trailer then fish right there. Alone. Solitude is relaxing. It is my Zen thing. I blew past the Sanderson Ranch, making the right turn at Wiggin’s Road, then right again at Annie’s place, circling around the perennially green pastures of the Sanderson’s ‘stump farm’. With nary a glance, I passed Chris’s trailers near the end of the road. He wouldn’t want his hermitage invaded. I shot up the curving grade of my sandy driveway. Everything looks just the same as when I left it. No need to hesitate. I had already decided to approach the river from across the top of my property, choosing this route so no one could possibly see me. One person in Nature alone, undistracted, hears and sees more. On the best days, the experience evolves beyond sentience; entering Nature’s gift, her ‘tonic of wildness’ cleanses the spirit. Two or more people fishing can turn competitive: conversations degrade to splitting costs, where to fish, when to leave or move. Too often, the experience becomes shabby and escapist. Tonight, with the river to myself, I could immerse into the manna that can be the magic of this archipelago. I live just above the intimate, Cottonwood-lined green glen at the end of the road, where the mysterious river bends dramatically, passing through and beyond green pastures, narrowing into a shaded, tree-lined slot. Many hours I spent here with Chris, my fishing mentor and the only fishing partner I could tolerate. It was Chris who, in order to ‘control’ access to the river and without my knowledge, persistently pestered my landlord until, for respite alone, he offered the property to me as a rental. From my trailer atop this sandy knoll, I would slip out to enjoy this treasure, fishing the rising tides each season for the past three years. As payback for securing the rental for me, Chris placed me under threats of excommunication if I “ever spoke of this spot”. Entering this conspiracy to protect the ‘spot’ overlooked a few facts: it is public property at the end of a public road leading to the river, attendees park then walk through what amounted to a public parking lot, passing by a well-used fire ring and tenting area along a short, well-worn trail. Chris was different that way – all his fishing secrets were sacrosanct, as were his many distracting idiosyncrasies. With the ferocity of a hungry grizzly digging after a marmot, the more privacy Chris sought out, the more determined became the usually inaccurate gossip about him. Before descending to the river, listening for sounds of people, I laced up my caulks again. Nothing. Just my own breathing, the familiar eagle family screeching at each other, ravens harassing the eagles, the off-shore wind through the giant Spruce lining the far bank despite Monk’s best efforts to log them off. Having decided to try the new run, I would have to fish from Monk’s logging slash. It felt fitting in some way, a gesture of respect, hopeful perhaps, for some aspect of recovery after the destruction beaten down upon Nature by industry. I knew of people who bathed at this area, but I was not one of them. I never immersed myself in this water. This is not a sparkling northern river – its dark flow does not invite as other waters might. Sure, it was Monk’s property. But he purposely left logs and up-ended stumps behind after tearing up the well-worn river trail to discourage anyone from trying the river that crossed through this scarred corner of his land. Struggling through the slash, cursing Monk, I eventually acquired a tentative perch on the bank. I stood beside a leafless, grey, Spruce sapling, knocked over during the logging. Leaning far out over the river at the top end of the pool, the tips of a few stripped limbs actually in the water, it presented a minimal hazard to my line and only if I was careless. I cast to the far bank, downriver, letting my lure’s action work with the slow tidal push inland as I reeled in line. Bits of green seaweed floated past, upriver. Interior ranges and expansive collection swamps feed the Tlell. Draining the center of Graham Island, it is a slow, small river, rich in fish. Cedar roots leeching into the water produce a decidedly reddish hue, making it difficult to place the next step when wading anywhere but the shallowest of gravel bars. Successful upriver anglers tune to feel and vibration because the Tlell is a river of snags and monstrous blow-downs, which discourage the meat-fishing set, who tend to roost and carouse only where easy access abounds. Suddenly, my rod jerked violently, pulled almost from my hands. I released line from my Silex reel, precariously managing the speed of the release, the torque of the pull and the angle of the rod, trying not to lose this fish. The silver Northern Coho leapt clear of the water, splashing down in a great writhing contortion, taking off on another spectacular surface run. Fear not, you will be released, my friend, but in the meantime, let’s see what you’ve got for me. And what a magnificent effort! It took several more ferocious runs downriver, testing my line and skill. I could just hold it. Finally, it changed direction and then, anti-climatically, my line snarled into the limbs of the sapling leaning over the river. Damn you, Monk! The rod instantly changed from a dynamic, carbon-fiber connection to an ineffectual pole. The line from the reel to the limbs remained limp as I watched the Coho jump several more times mid-river, my hook in its mouth, like it was mocking me. I had to free the fish. Maybe it would free itself, maybe not. I could not leave it to chance that it might die tethered like that. I turned around to scan the slash behind me, then the bank upriver and down. No one. Good. How could I let the fish entangle itself in the one snag in the river? The wild Coho jumped again, this time upriver, my hook still in its mouth. I could imagine how angry it must be. If I could free the line from the limbs, it would still have a chance to spawn. I put my rod down, quickly unlaced my caulk boots, kicked them off, peeled my socks and dropped my fallers’ pants, grey-wool Stanfields and thermal T-shirt. Standing only in my white underwear, swarms of black flies, mosquitoes and no-see-ums attacked me immediately, eating me alive. I would have to be quick. I took a step off the bank, expecting it to be knee deep, but crashed full into the tepid river up to my chin. I cursed, feeling the gentle persuasion pushing my feet across the slimy bottom gravel. I let go of the line, reaching up for the leaning sapling. As I worked hand-over-hand along the tree out toward my line, the sapling bent nearer the surface, the weak but stubborn current soon divesting me of my remaining stitch of clothing. Fully aware of the irony of this effort to free a fish in the ‘Charlottes, where fish are as abundant as raindrops, I thought, There’s not much Zen being caught hanging stark naked over the middle of the river. Still, I felt obligated to influence the outcome of this situation. Hanging there, I worked fast, unable to snap the iron-tough limbs, making it doubly difficult to untangle the line. The Coho had stopped rising while I continued what was becoming an arduous struggle fulfilling my duty to my self-imposed ‘community service’. All the while, the infuriating flies chewed at any part of my exposed body. Finally, I dropped my freed line into the water, watching it sink away from the limbs. I repeated my gymnastics back to the bank, scrabbling onto shore. I dressed hurriedly; thankful there were no witnesses. Reeling in the line that once hooked a now, long-gone, wild Northern Coho, it suddenly stopped. Is it? Could it be? No. The line is just snagged on the bottom. I pulled steadily on the line. It stretched. I pulled more, it stretched again, and then I felt a small amount of give. Maybe… I worked the line, the lure and the resistance until I retrieved my catch to the bank. I was trying to land a giant, waterlogged Sitka Spruce limb. Damn you twice, Monk! I have no idea why the line, the rod, or my temper didn’t snap while I was pulling it in, but here I was anyway. The hook disappeared deep into the fibrous wood. I dropped the rod several times trying to grab the limb. But each time I hauled it close, the limb sank out of reach toward the murky bottom before I could grab hold. Eventually, it occurred to me I could utilize the toppled sapling. I reeled my catch in again, managing to wind loops of line around a broken limb. Now I had the line anchored. I made a desperate lunge, grabbing for my prize, flopping with the broken end in my arms backwards into the slash, gasping for air. I hauled the rest of the limb onto the shore. It was a twenty-foot beauty, a real Tlell trophy. I’d enjoyed enough Zen and angling for one evening. Retelling this story, rarely am I afforded the benefit of the doubt as to the veracity of the details. I have come to accept it that a pack of entertaining lies will satisfy and compete with any well-told truth. So, for the listener who has not shared my experience, I adjust the details, dimensioning the limb, which can still be found laying on the bank today, to just over ten feet long. 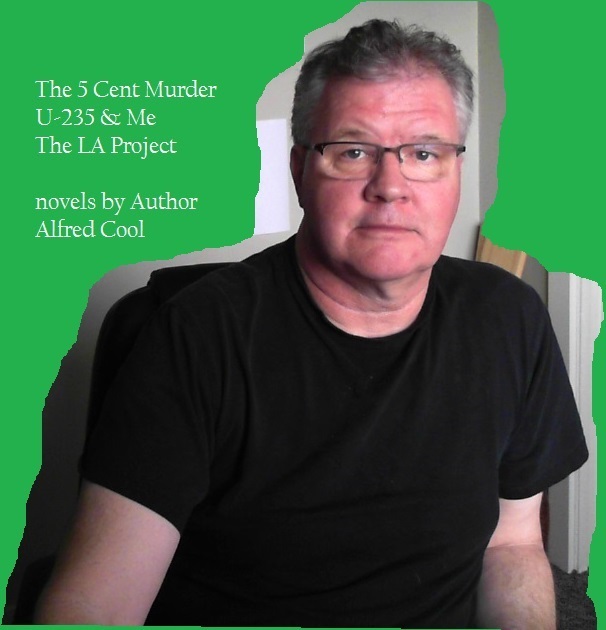 Alfred Cool has written 6 novels comprising his BC Series. Since 2010, he has won awards in short story contests, has published e-fiction, and is published in three Canadian anthologies. He attended Simon Fraser University to pursue English as his major. After logging, Al enjoyed a lengthy career as a computer systems analyst and taught privately and as a college instructor. He is a member of the Vancouver chapter of the Canadian Authors Association and the BC Federation of Writers. He writes extensively and intimately about his travels on the coast of British Columbia.